Northern Illinois over Marshall? What was I thinking? Noooooo! But a couple weeks before the first bowl game even kicked off, Kerry dropped a nice envelope on me. I'm calling these pre pick prizes, cuz it helps me sleep at night. Pitchers and catchers report in about 35 days. That's a better indication of the end of winter than Groundhog Day. 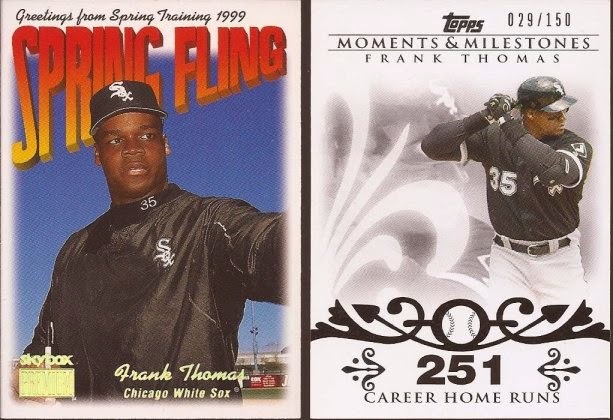 That Moments and Milestones is the 2nd one I have, and both are of Big Hurt's career home runs. If Dime Box Nick's math is to be believed, that is 2 out of 12,529 cards. Otherwise, I have completed .016% of the set. Got a bit to go. 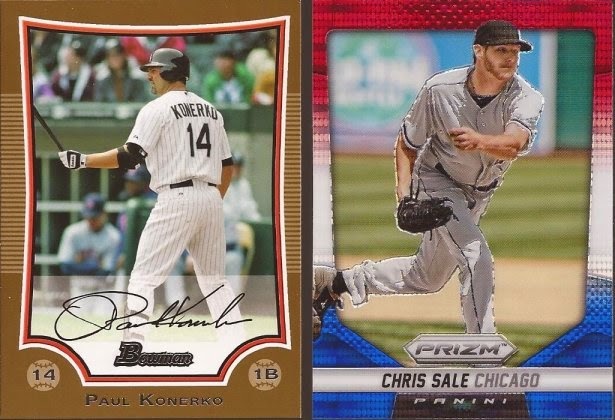 Gold Paulie for the binder. The Holland flag look does not save that Prizm. Kill the brand, Panini. Kill it with fire. 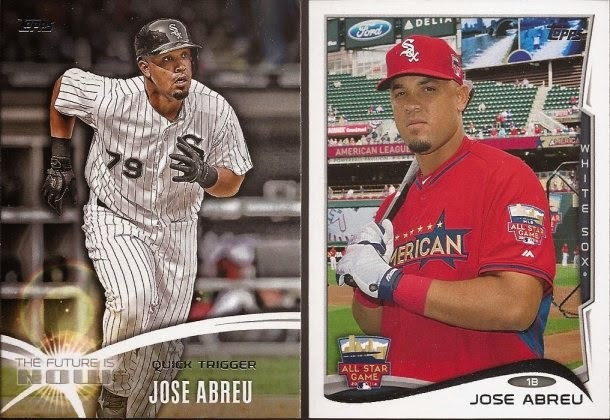 The Renteria was sitting on the most wanted baker's dozen, so a great removal because that is a killer throwback the Cards had. Teddy goes into my master set for the 2013 Heritage. Check my Wants page if you have some of those lying around. And the prize of the envelope. Into my Igushi collection these baby goes. Not sure purple is a good color with grey (or any other color really), but Kerry gifted it to me, for pre coming into 10th place, so that's the prize you can expect for finishing just out of single digits in his contests. Thanks Kerry. 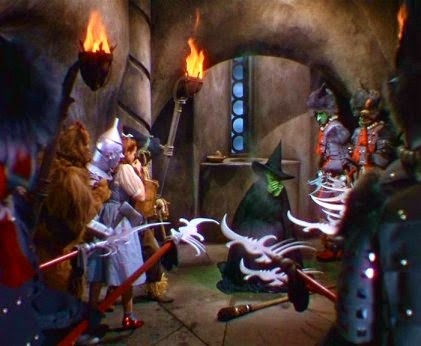 I hope you all join in the college pick 'em next year. Watch me jump out to a HUGE lead and then falter at the end. 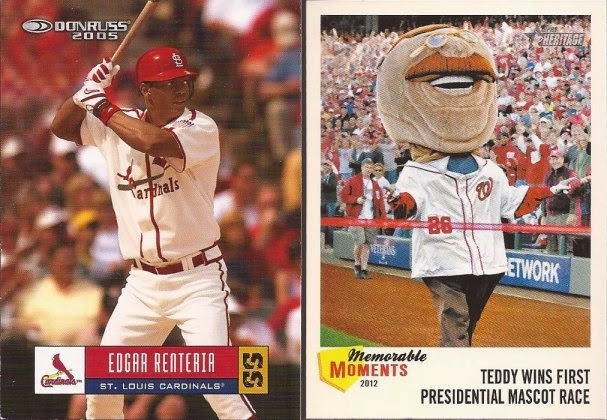 Teddy: One of the best (and perhaps scariest) cards ever. Congrats on "pre coming into tenth place." 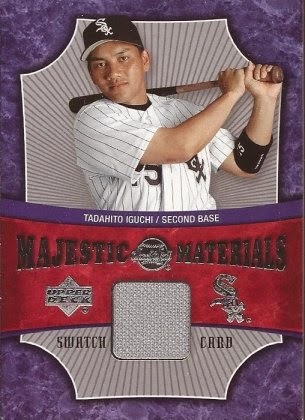 That Iguchi is sweet, and agree w/you on Prizm. With fire. Congrats on tenth place. Maybe you will be first next year!